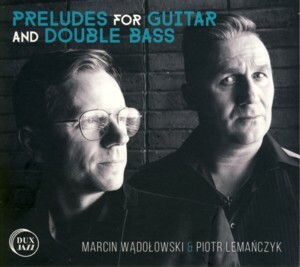 This is the fifth album by Polish guitarist / composer Marcin WadolowskiFind albums by this artist recorded in a duo setting with veteran bassist Piotr LemanczykFind albums by this artist. It presents ten original compositions, or preludes, all composed by Wadolowski. The intimate guitar and bass duo was superbly recorded by Piotr LukaszewskiFind albums by this artist and offers exquisite sound quality and clarity. Wadolowski, one of the representatives of the Polish Baltic Tricity scene, made a remarkable progress since the release of his debut album in 2011, flirting with diverse stylistic associations, such as Blues, Jazz-Rock Fusion and Jazz, and with this album touching, as the title suggests, upon some Classical Music influences amalgamated with a strong Jazz foundation. The pieces are all melody based but involve a significant measure of improvisation and interplay between the two partners. Lemanczyk is obviously an ideal partner for an enterprise of this sort, as his virtuosity and inventiveness are absolutely astounding. He is one of the most proficient and accomplished bassist on the Polish scene, and on this album his presence is felt stronger than perhaps on any other album he recorded to date, proving his immense talent, technique, feel and musicality. Wadolowski handles the acoustic guitar with gusto and respect, concentrating on playing the melodies, soloing and accompanying the bass solos, without trying any unnecessary pyrotechnics, which would have been completely out of place here. The interplay and cooperation between the two musicians is the heart of this music, and elevates it above the individual performances, feeding on the mutual respect and the wonderful intimacy achieved by the duo. Wadolowski behaved gentlemanly naming Lemanczyk a full partner in the process of creating this album, as anything less would have been simply unjust. Overall this is a wonderful, intimate and uplifting spiritually album, which emits superb musicianship, true camaraderie, amazing virtuosity and a gentle feeling of embracing, heartwarming music. An absolute must to guitar and bass aficionados, but no less heartwarmingly recommended to music lovers, who long for something low volume, which strikes powerfully between the eyes (ears). Brilliant stuff and hats off to the people in charge of the strings!